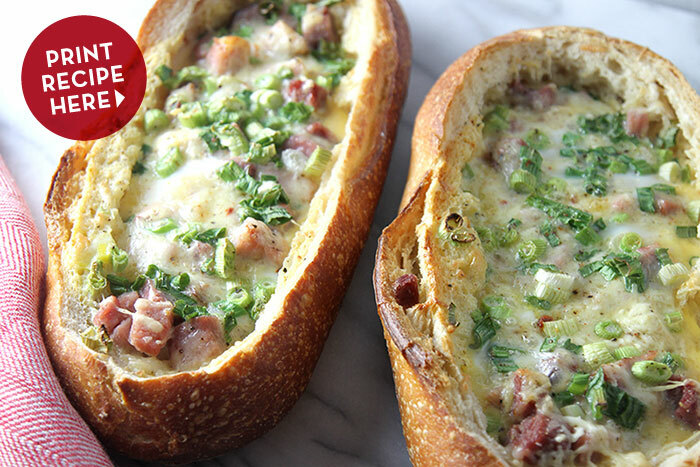 These egg-stuffed bread boats are our new, most favorite breakfast item to serve to guests. They are easy to assemble, and delicious to eat! 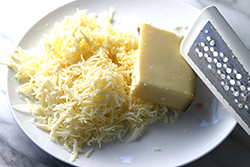 The secret to this dish is one key ingredient, real Gruyére cheese. 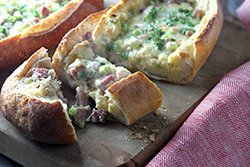 Nothing can compare with it's nutty, rich flavor when baked and paired with bread and eggs. 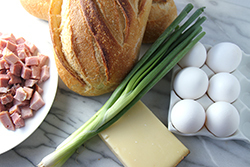 With this triple combo base, feel free to get creative with additional ingredients. Try using different cheeses, a combination of cheeses, sautéed veggies, bits of meat, or other fun mix-ins such as pesto or salsa. 3. 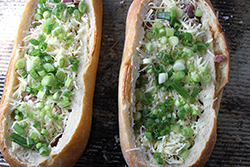 Grate the cheese, dice the ham and slice the scallions. 4. Whisk the eggs with the half-‘n-half, pepper, salt, and paprika until evenly combined. 6. 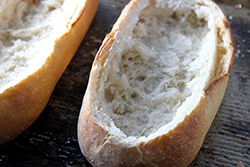 Bake the filled loaves at 350°F for 20-25 minutes, or until eggs are set. The temperature in the center should be 165°F. Slice the loaves into generous pieces, and serve while hot.